Considering the impact of food on stress: does stress prevent us from being and thinking sustainably? Our discussion is taking us further into the otherwise much neglected personal and social domain of sustainability. I am fascinated by Kathy Miller’s response to my initial blog post which suggested a lack of coherence between what we know and what we do in addressing sustainability challenges. Kathy’s February blog considered the inter-connection between multiple attitudes and values of a person, the influence of other people on us, as well as normative societal prescriptions. The follow-on discussion on our blog was most stimulating to read. One commenter expressed his happy surprise about connecting the methodology of Alcoholics Anonymous (AA) to being able to combat his own “addiction to a high carbon lifestyle”. Interestingly the principles of AA emerged out of the Initiative of Change Movement (IofC) out of Caux, above Montreux in Switzerland. IofC is, to my understanding, one of the longest living change movements in history (initially called the Moral Re-Armament) and has played a significant role in the peace talks between Germany and France after the Second World War. They run a series of conferences in the summer months up at Caux (heaven on earth! ), including TIGE (Trust and Integrity in the Global Economy) from July 5-10, 2014. I am featuring a chapter of why IofC and Caux are so special in my upcoming book “The Collaboratory” (Greenleaf Publishing, July 2014). Kathy shares telling examples of her own dilemmas which have triggered a more courageous behaviour on my side this past month. I was recently invited to a big meeting called by our Group’s COO. After staring in disbelief for a while at the “Canadian Premium Glacier Water” that was put in front of me (in Switzerland our drinking water is of excellent quality), I was wondering if I should say something and get the meeting off on a wrong foot or if I should remain quiet. My facial expression must have been quite transparent as the COO interrupted his opening speech by saying “Madame Muff, don’t worry, the water inside these bottles is our own tap water from here, I just like the aesthetic of the bottles. That is allowed, isn’t it?” My point was made and we all had a good laugh. What I appreciate particularly about Kathy’s blog is the fact that she not only lists the challenges of trying to bridge this lack of coherence mentioned above, but that she also provides solutions. She believes that inconsistencies between attitude and behaviour can be “attacked through intentional self-awareness”. I agree! In fact, I have spent so much time in personal development (of myself and others) between 30 and 40 that many of my friends started to wonder if I was ever going to be the active and creative person they have known me for. A higher consciousness does result in a higher self-awareness (and vice-versa) and I believe this is a critical and non-negligible starting point for any progress to reduce the above mentioned incoherence between what we know and what we do to improve sustainability. Why are we sometimes absolutely unable with our great mind and willfulness, self-awareness and determination to do what we know is right? In addition to “intentional self-awareness”, I would like to offer an additional, maybe just as important, aspect that can trigger change: nutrition. I am basing this statement on the hypothesis that incoherent action is a result of a person who is out-of-balance, both from an emotional as well as a physical perspective. Why are we sometimes absolutely unable with our great mind and willfulness, self-awareness and determination to do what we know is right? I believe we are ignoring the important role that our physical body plays in all of this. I have been observing a strong relationship between food and stress in myself over the past months. There is much emerging research on the impact of stress on leadership and performance by evaluating the impact of personal development training to enhance Kathy’s “self-awareness” (colleagues at EPFL are working on a study that will be released in about a year). 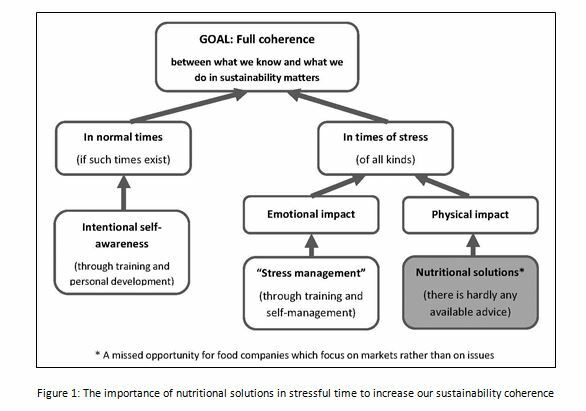 As far as I know, there is no similar study looking at the impact of nutrition in the relationship between stress and leadership and performance. Of course, we all know that in periods of time, comfort food is particularly attractive and leads in the long-term to obesity (Dallmann et al, 2003), yet I didn’t know that females were significantly more affected than men by eating more in moments of stress than man – our inhibition just melts away (Weinstein et al, 1997). I can certainly relate to the conclusion of Weinstein’s study: “In females, the inability to maintain control of self-imposed rules concerning food intake is an important factor in the relationship between stress and eating.” It appears that a chemical misbalance in our body throws us so much off track, that we lose our otherwise so well-functioning self-control mechanisms. In such moments, “self-awareness” flies out of the window! I am writing this blog on my first food “build-up” day after a week of fasting. This is not by chance. I have been observing myself (emotions and body) during the past months and have noticed how my body increasingly got out of balance in the past 6 weeks of very high work-related stress. It got so far that my body started to simply store all water and that the digestive system sort of broke down. I know how to listen to my body and what to do. I’ve had the great chance to learn how to fast at age 17 with my dad and have been regularly fasting about once a year since then, not for religious reasons, but to detox and cleanse my body. It has become my self-healing method of choice. I would actually love to be the person I am when I am fasting…. I am calm, concentrated, a better listener, less aggressive, time is stretched in such a way that I managed to get things done in the allotted space, in the evening everything important is done, and I walk out of the office with a smile. Last week was as crazy as any of the other weeks in the past month and a half. However, my performance and my sensation of the week were incomparable to how I did and felt in the previous weeks. Mind you, the only thing different was that I was not eating (only drinking water, tea and occasionally a bouillon). How is it possible for food to get in my way to such an extent? I suspect that stress and foods with added sugar and stimulants in general (caffeine et al.) are a dangerous combination. I noticed that I was no longer able to control my chocolate addiction; my body just needed and demanded it – a real craving. Now, I am a bit of a chocolate buff and have been experimenting at home with the creation of no-sugar-added chocolate. Stevia is a current obvious solution and I am delighted to have just found a small Swiss chocolate company (Villars) that has started to sell a no-sugar added 70% dark chocolate sweetened with Stevia (possibly the first world-wide). And more importantly, how can I be that relaxed, mindful and respectful (to myself and others) person I am when I am fasting, when I am eating (I love food)? This is my current puzzle. In line with Kathy’s great public commitment to reduce her air travels this year, I have promised my nutritionist friend – and I am publicly committing also here – that I will no longer eat in front of my computer but find a quiet place where I will eat slowly and consciously (this will be painful) and I will abstain from all stimulants including chocolate during the work-day and enjoy these items exclusively as pleasure items (what would life be with a little bit of chocolate in the evening, or an espresso on Sunday morning?). I will also test the effects of a fast-like day a week (eating mono-food such as a veggie, fruit or rice, or drinking only vegetable juices) to avoid another physical system over-load like I have just experienced. Fasting shouldn’t be an emergency break in times of stress, although I have increasingly used it just for this. We need to be both in an emotionally and physically balanced state to be our very best – which is really what is required to live up to the challenge of embracing sustainability in our life. In conclusion and in response to Kathy’s blog: there may be times when reducing the consistency between what we know is right and what we do is not just a question of willfulness and determination but of a physical pre-condition. We need to be both in an emotionally and physically balanced state to be our very best – which is really what is required to live up to the challenge of embracing sustainability in our life. What I am wondering is what – if any – relevance this discussion we are having has for organizations to be in their very best condition to embrace sustainability with all the courage they need? Or are these separate topics with no inter-connection? Your thoughts and contributions are very much welcome! I look forward to a rich online discussion between now and Kathy next blog in a month from now. 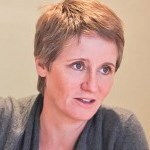 Dr. Katrin Muff is Dean at Business School Lausanne (BSL), Director of the innovative Sustainable Business DBA program and co-directs the world-class Executive course in Sustainable Business jointly with her colleague Thomas Dyllick of the University of St. Gallen. She writes a weekly blog and is actively engaged in transforming business education to serve the world (project 50+20). ← We do have solutions to the inconsistency dilemma – are we willing to apply them? Very interesting Katrin. I agree completely that in order to be mindful and to live lives that are sustainable, we need good nutrition, exercise and sleep. And we need to find ways to control stress. Also on a societal level, overeating contributes to the obesity problems, which in turn, leads to many health-related problems that tax our health-care systems. Last but not least, over- eating (especially junk food) is probably connected to the larger societal problem of over-consuming in general! This contributes significantly to other sustainability issues such as how to dispose of waste, overuse of electricity etc. and think about the amount of water it takes to produce these sugary soft drinks and beers! Hi Kathy, thanks for making these connections – now that I read them, they are obvious and HUGELY important. Obesity, over-consumption, are such mega-themes ….. wouldn’t it be interesting to pursue how we can align ourselves on a I-we-all of all 3-level perspective for a healthier and happier life and society? Reflecting on the impact of nutrition on our mindfulness. Enjoy reading the next chapter of our ongoing Transatlantic Dialogue!